I am used to it by now. Having lived in South Carolina for well over four years, we all know what September means: Start of college football! No, you idiot. It means hurricane season. Hard to believe, but this is the fifth September I have spent in Myrtle Beach. Each one has brought with it some type of hurricane threat. I survived the first four Septembers so why should I be concerned about this one? The hurricane that is lingering off the coast right now is just like all the others, right? I never allowed myself to get too worked up about past hurricanes that flirted with–or even impacted–our area. However, Hurricane Florence is a little different. My stress level for this one is more elevated than the others. I wish it would stay away, but our area will be impacted by Hurricane Florence in some way. Two years ago, I experienced Hurricane Matthew. It impacted our area quite a bit. Our doors flew open, our fence posts toppled, and our power went out. It wasn’t too enjoyable. But here is the thing: When Hurricane Matthew met Myrtle Beach, it was a Category 1 hurricane. If Hurricane Florence hits us, it is supposed to be a Category 4. Now I am sure most of you out there can guess what that means. If not, let me give you a hint: hurricane intensity doesn’t lessen as the category climbs higher. A Category 4 hurricane brings devastating 133-155 MPH winds and a storm surge 13-18 feet above normal. To say the least, it can be devastating. But don’t feel as if we are on a collision course with doomsday just yet. According to the forecast, there is a 50% chance that Hurricane Florence will hit our area with that intensity. Are you an optimist or pessimist? Other factors besides the sheer strength of Florence get me nervous too. We are in a new house. We have Sloan. We have a large lawn that is prone to flooding. But all that doesn’t even cover the aftermath headache that we will face once the hurricane rips through the area and the recovery process begins. As you can see, my focus is divided in a few different directions, especially since I am in charge of the Coastal Carolina University social media response to the hurricane (there are thousands of students and parents depending on us for accurate and updated information). Bottom line, there is no escaping the fact that Hurricane Florence will impact the Grand Strand in some way. The question is just how severe her punishment will be. Don’t worry about us because we will be fine — we have an evacuation plan in place and our little family will stick together. Don’t let my nerves about our personal situation concern you. Instead, let’s turn our attention to those who have nowhere to go nor the means to prepare. 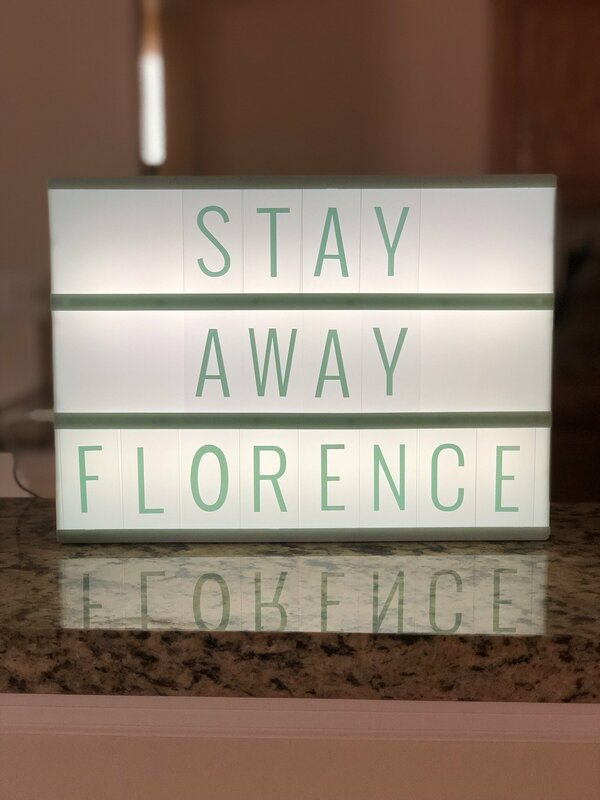 A lot of people will be in the dark (literally and figuratively) when Hurricane Florence hits. Let’s pray for them. I will keep everyone updated on the track of Hurricane Florence. It isn’t a particularly fun time but we will make the best of it. Let’s hope that it is less severe than what we are preparing for. Don’t Blink. This entry was posted in Uncategorized and tagged Hurricane Florence by brent. Bookmark the permalink.